Table Lamp features a polished chrome effect stand with an Illuminated globe. 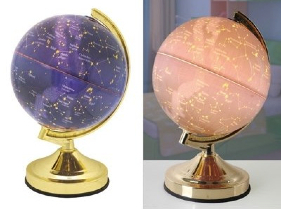 The globe has constellations of the north and south hemispheres. Simply use the 4 way touch control to to turn on/off and to choose the brightness. 15W E14 Pygmy bulb is included.